It’s been a minute since I’ve blogged. More like a few years. I had a baby and now Agnes is 20 months old. She goes to daycare 30 hours a week so I’m now able to focus a bit more on Little Things Studio! Yeah! I probably should do a post about her, because she’s really wonderful. Anyhoo! I’ve just released a new set of hymn greeting cards that I’m SO excited about! It’s eight designs with the hymn history on the back! I wanted to tell you the hymn story of “Jesus Paid It All.” Sometimes a good story is made when two seemingly random events occur and come together in a lovely, new marriage. The making of “Jesus Paid It All” is such a story. The lyrics and tune of “Jesus Paid It All” were written separately by two members of the same church in Baltimore, Maryland, Monument Street Methodist Church. In 1865, Elvina Mable Hall (1822-1889) was sitting in the choir loft during a lengthy pastoral prayer. Unable to focus on the prayer (we all know how that goes), Hall began to write a poem on the flyleaf of her hymnal. After the service, she gave a copy of her poem to her pastor, Reverend George W. Schreck. Schreck remembered a tune that another church member had written and given to him. John T. Grape (1835-1915), a coal merchant and organist choir director (what a career pairing) at his church had written a tune that Schreck though would be perfectly paired with Hall’s poem. Schreck asked Hall to write a refrain for her poem, and the hymn, “Jesus Paid It All” was born. It was first published in Sabbath Periodicals and soon became a favorite hymn across the United States. And there you have it— the makings of a beautiful hymn: truth-filled and sensory-rich lyrics, a catchy tune, and images from the Word. And because we believe in God’s sovereignty in all things, we can say that the union of Hall’s lyrics with Grape’s tune was no coincidence. We can sing “Jesus Paid It All” with the assurance that God orchestrated the composition of this hymn. Sadly, we can’t find a picture of Monument Street Methodist Church or any of the key players in this hymn history (don’t you want to know what Elvina and Mr. Grape looked like?). 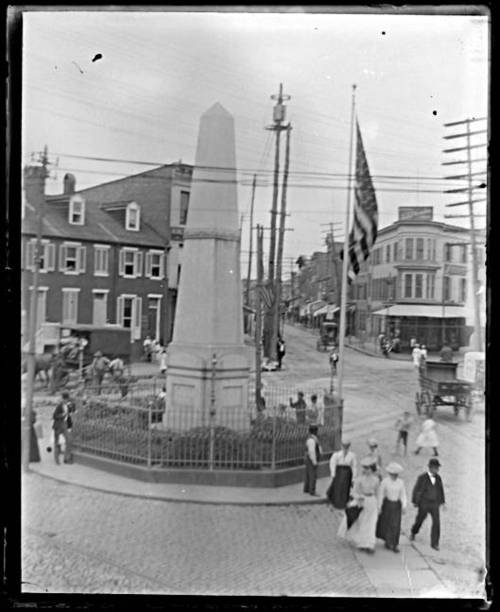 But we do have a photo below of Monument Street in the early 20th century. You can imagine Monument Street Methodist Church’s parishioners strolling down the street to their church service.